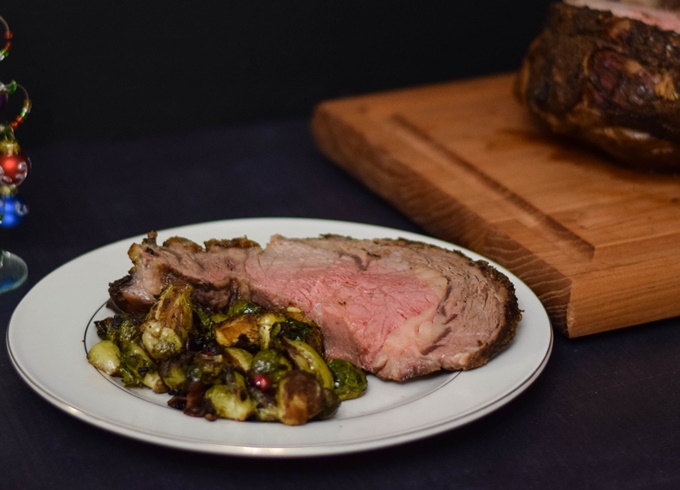 A juicy, tender and perfectly seasoned and cooked Prime Rib Roast recipe is my latest result with the #RoastPerfect app. Let’s face it. Roasting meat can be a touchy thing! For that reason using the app and choosing Certified Angus Beef® Brand, the highest quality meat on the market is priority for me. 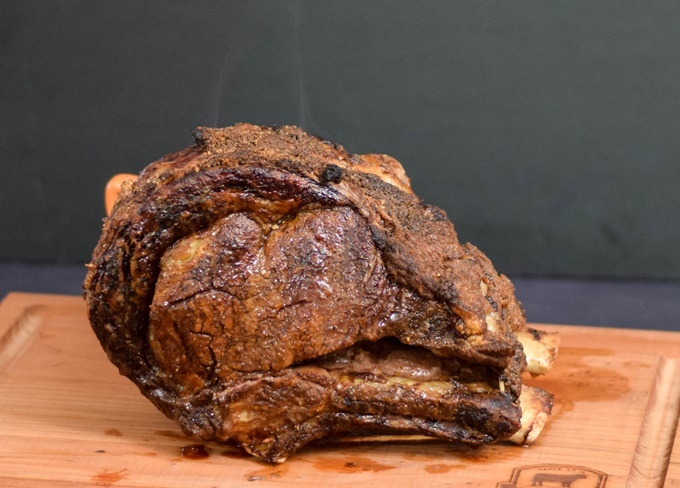 When the holidays get here one thing I think all cooks like to do is come up with something delicious, beautiful and impressive to put on the table like a perfectly roasted Prime Rib Roast! I have always been impressed with what I have seen others make and always wanted to do so myself. This year I had my opportunity thanks to Certified Angus Beef® Brand and Sunday Supper Movement. Over the last five years my opportunity to cook for a crowd for a holiday meal has dwindled. Since we moved out of our home area I have had less motivation to cook a holiday meal when its is just the two of us. Distance has made it rough on my ability to entertain my family. Discovering the #RoastPerfect App has given me more of a desire and made it easy to still entertain even if it is just Grumpy and me due to the fact I an just input the size of roast I am roasting and all the directions as well as roasting time is right there for me to use as my guide!! 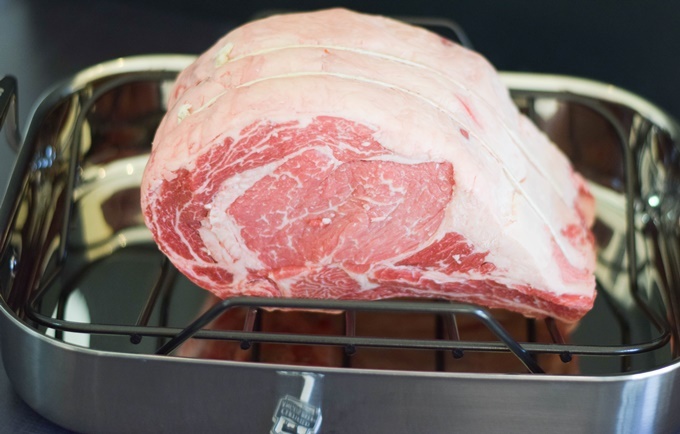 In previous posts I stated how I was intimidated by roasting because my meat would come out too dry. The last 3 times I made a roast and used this app, I have not been disappointed and my most recent experience is the best one yet! My in-laws decided to come to our home for a visit so I decided to attempt a more special roast cut this time and promptly stopped in at my local Price Chopper and ordered a semi boneless Prime Rib Roast. I tested this app on a couple of different roasts prior and both times the roasts turned out perfectly done. 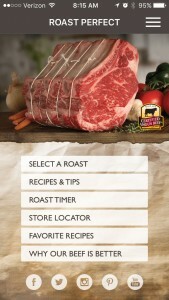 My Mother-in-Law watched me prep the meat for roasting and saw that I was using the app as a guide. She thought it was so cool that I could pick the cut I was roasting and decide what size roast I needed for the number of people serving. I also used the cooking guide for roasting with Chef Michael for a visual instruction on how to prep and roast the beef. She watched as I entered the weight of the roast, and retrieved the the directions with a timer to set for the entire process. She was so impressed she immediately downloaded the app onto her phone! 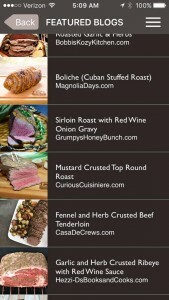 I also made sure to show her where to find the recipe section and the featured blogs on the app. After just 15 minutes in the oven at 450, the “searing time”, the house was already beginning to smell absolutely wonderful! I used a rub I made while on my Certified Angus Beef® Brand visit in Ohio. The anticipation of eating this roast just grew and several times it was heard in the house how good it smelled and how we couldn’t wait to try it! While we were waiting for the Prime Rib to roast to perfection I made slightly adapted a recipe I found on the app for Brussels Sprouts. 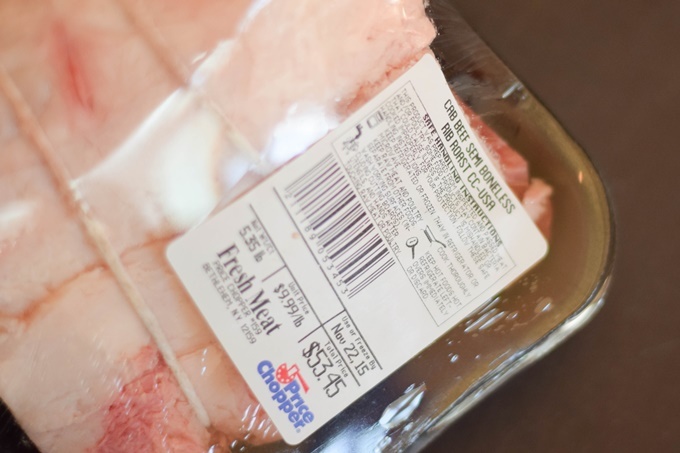 Certified Angus Beef® Brand made their recipe for us during our #SundaySupper event and this recipe changed my mind entirely about eating them! I hope you will take my experience and download the #Roast Perfect app. Then, make your family feel special with a Certified Angus Beef® Brand roast that you roasted to perfection for them this holiday season! Be sure to visit Certified Angus Beef® Brand’s website and follow them on their social media channels! 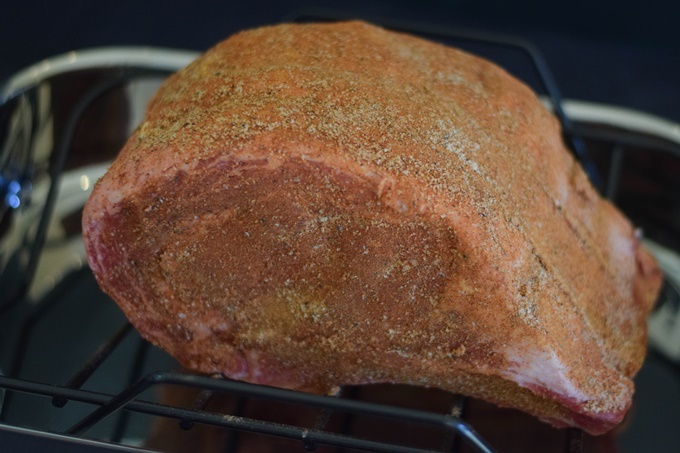 Follow Certified Angus Beef ® brand’s board Roast Perfect on Pinterest. Use the Certified Angus Beef® Brand Store Locator to find your local retailer! This Brussels Sprouts recipe is an adaptation from the Certified Angus Beef Brand recipe found on their app. 1-1/2 pounds Brussels sprouts, trimmed and sliced in half. Mix together the ingredients for the rub. Use approximately 1 tablespoons of Rub per pound for the roast. I used 5-1/5 tablespoons. Rub the roast with Santa Maria Rub coating well. 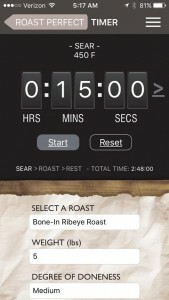 Place roast in oven and set app timer. The timer will run for 15 minutes. After the 15 minutes you will reduce the oven temperature to 325 degrees and continue roasting for approximately 2 hours and 36 minutes. 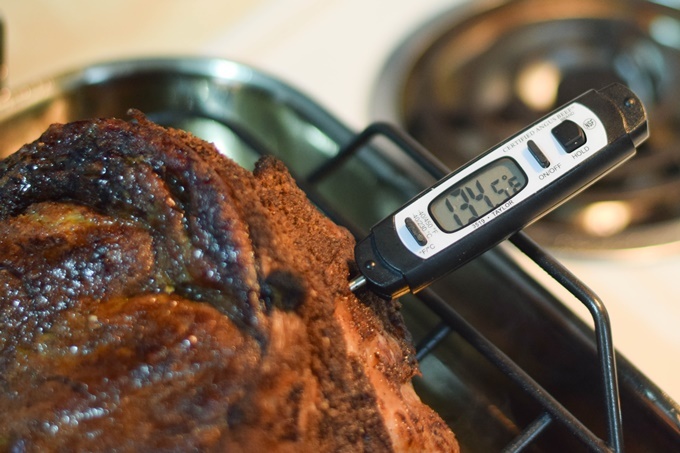 Check the roast temperature with an instant read thermometer inserted into the center of thr roast to be sure it is at the doneness you want it to be. Remove roast from the oven and let it rest for 15 minutes. In a large skillet, cook bacon pieces until almost crispy. Add pecans and continue to cook until bacon has crisped. Be careful to not over brown pecan pieces. Remove from skillet and set aside. 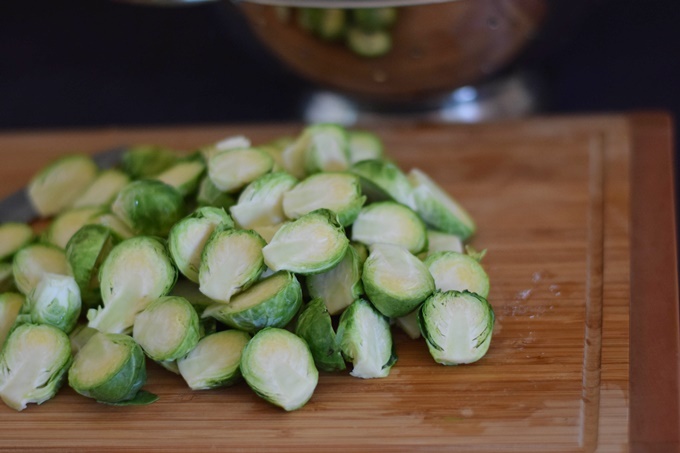 Add Brussels Sprouts to skillet, season with salt and pepper. Cook on high 2-3 minutes, until a nice sear has developed on the sprouts. Place in oven and roast 15-20 minutes longer or until sprouts are fork tender. Toss with bacon pecan mixture and pomegranate seeds. Simply gorgous and those brussels sprouts are to die for! What a perfect holiday meal!! Fantastic meal with the roast and those tasty Brussels sprouts. 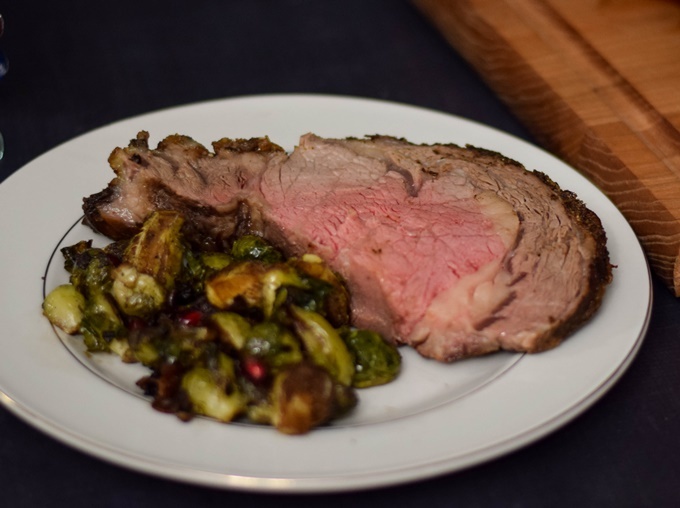 Oh, boy, a nice thick slice of your gorgeous prime rib plus a side of Brussels sprouts sounds like the PERFECT holiday dinner!!! Absolutely perfect! I have got to try that rub!! Yep, I’ll take a plate! 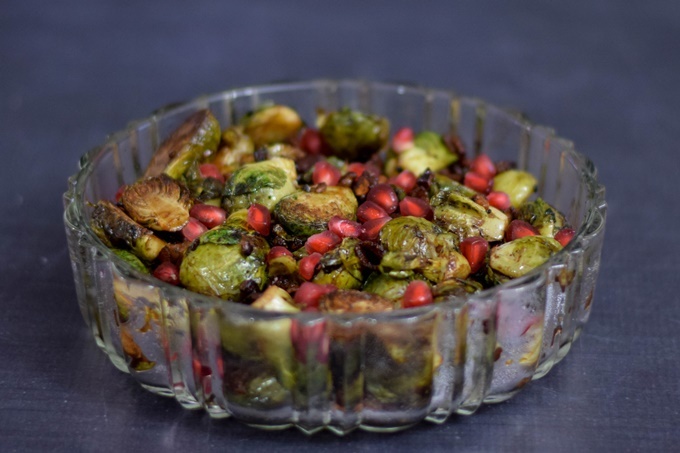 Your roast looks amazing and those Brussels Sprouts are so good! Your roast looks gorgeous! I love that ap. You can make your roast whatever temp you want. Yours would be perfect for us!! The Brussels Sprouts look like a perfect side! The meat makes the meal, but oh, those sprouts. I need them! You made a PERFECT roast! That is the perfect holiday meal right there!! Love that you paired this with those tasty looking brussels sprouts. 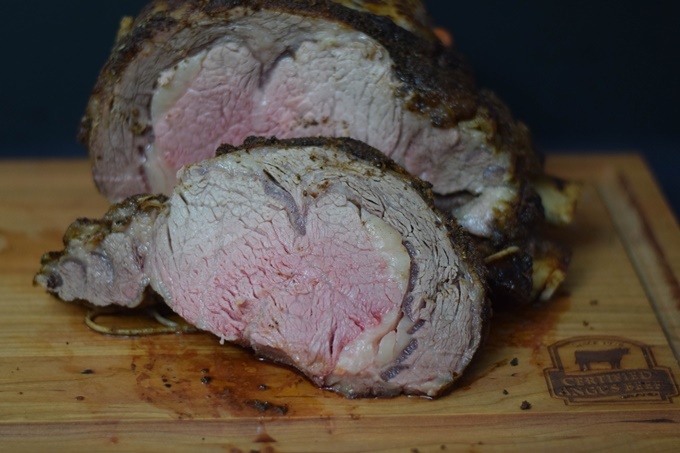 I cooked a prime rib roast with the Roast Perfect app and was so pleased with the results!